MERL P DX289 PH1/668. 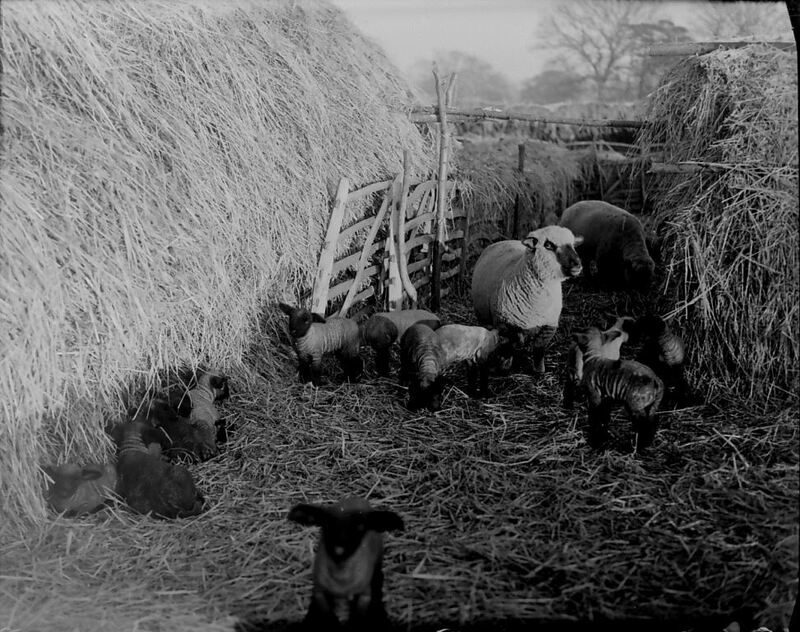 Ewes and lambs in the lambing pen, Kiddington, Oxfordshire. Taken by Eric Guy. In the last of MERL’s seminars in the ‘Untouchable England’ series last week, Ollie spoke about MERL on the BBC in the 1950s. Over the past few days I’ve come to notice how many programmes there are about farming on the BBC at the moment. I’m a lifelong Radio4 fan and, although I’m not normally up in time for Farming Today, I am (although I’m not sure whether I should be admitting it) a regular listener of The Archers. I don’t normally get the chance to watch much TV, but last week I came across a programme on BBC2 called The Hill Farm, which follows Gareth Wyn Jones and his family for a year on their hill farm in North Wales (a far cry from the type of farming there is in the are I grew up in – in the flat Fens surrounded by fields full of sugar beet). And this week I’ve made my first foray into BBC2’s Lambing Live (16 million sheep will be born in the UK this spring), this year following the Dykes Family on the farm in Scotland. I probably sound very ignorant and very naïve, which I don’t deny (rural crafts rather than farming are my area of expertise at MERL). I’ve found both programmes really fascinating, and they’ve brought to life lots of the objects, terms and practices that I’ve come across during my two years at MERL – such as tupping, drenching and hefting (which Ollie wrote a blog post on back when we started the Sense of Place project). And I do like Kate Humble’s bobble hat! I’ve also really appreciated the fact that The Hill Farm doesn’t shy away from the bloody, brutal and very ‘real’ side of farming that is undoubtedly not really thought about by most of us (the total farming labour force in the UK in 2006 was 534,000 out of a population of 60.6 million). And if that wasn’t enough, there’s also Countryfile on BBC1 on Sunday evenings, which regularly attracts more than 5 million viewers! It’s great to see that there is such a public interest in rural matters – and I hope that programmes like these really do help us better understand the important role that farming plays in all of our lives.